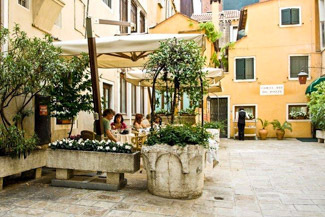 The Hotel Do Pozzi is a small, family-run hotel in a tiny campiello just off the Calle Larga XXII Marzo, one of Venice's most popular upmarket shopping streets. Breakfast is served at tables in the square during nice weather. As you leave the Alilaguna airport-boat station, turn left and cross a small stone bridge. Continue a few meters to the Calle Vallaresso and turn right. Walk straight ahead down the Calle Vallaresso, past Harry's Bar and a row of designer shops. At the first corner, turn left into the Salizzada San Moisè. Walk to the narrow canal alongside the Hotel Bauer, where you'll see gondolas on your left and a small bridge just ahead. Cross the bridge and walk straight ahead down the Calle Larga XXII Marzo. In a minute or so, you'll reach the Hotel Saturnia & International, which is on the right side of the street. In another few meters, you'll see a tiny side street called the Calle dei Do Pozzi on your left. Turn into the narrow street and walk a short distance to the Campiello dei Do Pozzi, where you'll find the hotel. Take the Alilaguna Blue Line airport boat from the cruise basin to the San Marco Giardinetti boat stop.